Mike Welch, Managing Director of Control Network Solutions (CNS), will be moderating and speaking at the Intelligent Buildings Track: Lighting Technology panel at the upcoming Continental Automated Buildings Association (CABA) Forum alongside other industry leaders. Leading the discussion on the role of international open interoperable standards in the 21st century smart lighting control and what end clients are really looking for and why, Mike will be exploring the need for interoperable solutions with real-time data access for clients. End Client requirements what are they really looking for and why? The role of international open interoperable standards in 21st century smart light control? Demand side management and the role of intelligent lighting in the drive to “net zero” energy consumption? Intelligent lighting controls, whose business is it? Is it wireless versus wired, wireless & wired and what does IoT really mean in lighting controls? Convergence what is it really good for? The “Cloud” based solutions, who’s “Cloud” is it, who owns the data/IP in the “Cloud”, can I change from “Cloud” to “Cloud”, how secure is it? Convergence – what is it really good for? To find out more about the upcoming CABA Forum and to register to attend please click here. WHAT DOES WIRELESS LOOK LIKE? In any given office space you could assume the air is free of wireless waves however, the remarkable image below exposes wireless waves in the environment. These are wireless RF transmissions from mobile devices; WiFi, GPRS etc and all have the potential to interfere with a potential wireless control solution! This is a great presentation by Harbor Research surrounding how the growth of smart systems and the Internet of Things can be catalysed: Read Here. This is a great manifesto from Harbor Research surrounding the future of the Internet of Things and the consequent need for a manifesto: Read Here. 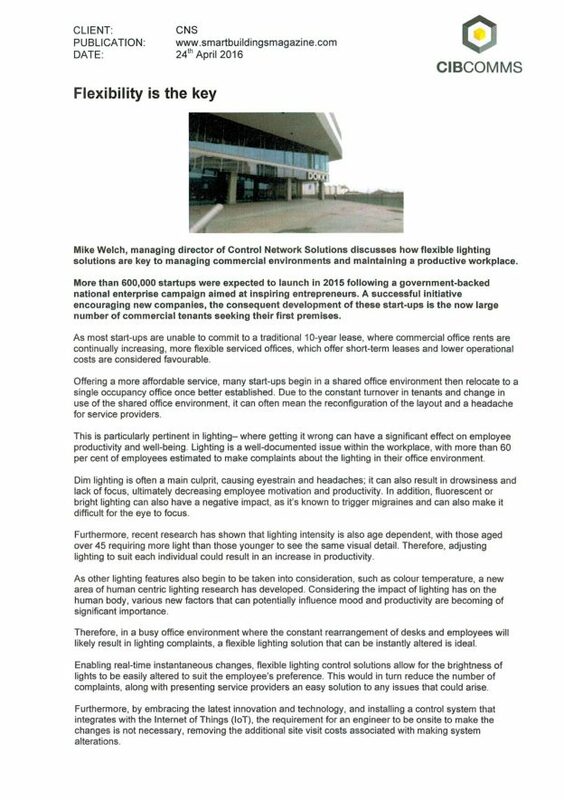 Lighting is one of the most expensive costs to a business, accounting for more than a third of a building’s electricity use and CO2 emissions. It’s therefore understandable that many companies and facilities managers are looking towards innovative smart control solutions to manage electricity and lighting usage. However, with the focus still firmly on the light source itself and as energy prices drop, are we actually considering the true cost of our lighting?